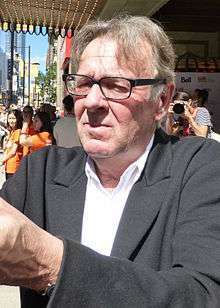 Thomas Geoffrey "Tom" Wilkinson OBE (born 5 February 1948) is an English actor. He has twice been nominated for an Academy Award, for his roles in In the Bedroom and Michael Clayton. In 2009, he won Golden Globe and Primetime Emmy Awards for Best Supporting Actor in a Miniseries or Film for playing Benjamin Franklin in John Adams. Wilkinson made his acting debut in 1976 and worked on several British television series, most notably the mini-series First Among Equals (1986). He first gained critical acclaim with his appearance as Mr. Pecksniff, in the BBC's 1994 adaptation of Martin Chuzzlewit. He made only the occasional film, including a brief appearance in 1995's Sense and Sensibility and a villain in The Ghost and the Darkness (1996). After becoming part of the ensemble cast of the comedy-drama The Full Monty in 1997, a role which earned him a BAFTA, he began to take film roles more frequently, including supporting roles in Oscar and Lucinda, Wilde, Shakespeare in Love, and The Patriot. He also starred with Jackie Chan in the 1998 film Rush Hour, as the evil British Ambassador/Juntao. In 2007, Wilkinson played Arthur Edens, an attorney with bipolar disorder, in Michael Clayton and garnered much critical acclaim and a nomination for the Academy Award for Best Supporting Actor. The same year, he played an uncle planning for murder in Woody Allen's Cassandra's Dream. Wilkinson lives in north London with his wife, actress Diana Hardcastle, and their two children, Alice and Molly. ↑ "Person Details for Thomas G Wilkinson, "England and Wales Birth Registration Index, 1837-2008" — FamilySearch.org". 1 2 Brown, Mark (22 February 2008). "'The thing you can't fake is that he has a moral authority ... he brings a sense of gravity, detail and intelligence'". The Guardian. Retrieved 7 October 2010. ↑ "Honorary graduates 2000–09". University of Kent. 2010. Retrieved 7 October 2010. ↑ Tom Wilkinson Biography Archived 5 May 2009 at the Wayback Machine.. Tiscali.co.uk. ↑ Riding, Alan (10 March 2002). "Oscar Films/View From Abroad; The Actor Next Door Quietly Savors His New Fame". query.nytimes.com. Retrieved 24 July 2008. ↑ "Newsmakers". news.bbc.co.uk. 15 February 2002. Retrieved 24 July 2008. ↑ "''In the Bedroom'' at Meta Critic". Metacritic.com. 23 November 2001. Retrieved 21 November 2010. ↑ "Official Casting for John Landis' 'Burke & Hare' Comedy". Bloody-disgusting.com. Retrieved 21 November 2010. ↑ "Fisher, Serkis, Wilkinson in 'Burke and Hare'". Heatvisionblog.com. Retrieved 21 November 2010. ↑ 2011 Emmy Nominations List: 63rd Primetime Emmy Nominations Announced Archived 7 March 2016 at the Wayback Machine., Huffington Post, 14 July 2011. Accessed 15 July 2011. ↑ 2 mins ago. "Honorary graduates 2000–09 – About Kent – University of Kent". Kent.ac.uk. Retrieved 21 November 2010. ↑ The London Gazette: (Supplement) no. 57509. p. 13. 31 December 2004. Retrieved 2012-07-30.